When I dusted off Lycadican version 5 and looked under the covers I decided that I was going to leave all possibilities on the table for making changes to the setting. After all, version 5 was conceived when I was a teenager in the early 90's... and it shows. In that time I was fortunate enough to meet Ricardo Bare and others who helped shape my understanding of game and setting design. Now, Ricardo is a professional game designer, at that time he was not, but he had a strong intuition of how things should be done. Not long after discussing approaches with him I took a large number of classes in Anthropology and Religious Studies which (with a couple classes on Archaeology) helped to further a naturalistic approach; which is, that a fundamental component of how peoples and cultures are shaped comes entirely from their environment, how they have adapted to it and how they relate to it. The first thing I started with is reshaping the environment. If you do not have a strong background in geography, I certainly do not, then the easiest thing to do is to start with the premise that your planet is roughly the same size and composition as the earth with approximately the same proportion of land and water. That way, you have a reference model for the underlying mechanisms of how climate works. You don't have to understand all of the mechanisms driving climate and climate change. Your result isn't necessarily going to be exact and it doesn't have to be, this is Fantasy after all, but it gets you going in the right direction. The first stop is tectonic plates. I think it somewhat relevant that you have a general understanding that the planet is made up of plates of lighter rock (lithospheric) that basically float over top of denser molten rock (asthenospheric) underneath. They move around primarily due to the convection current of the heavier molten rock within the earth. 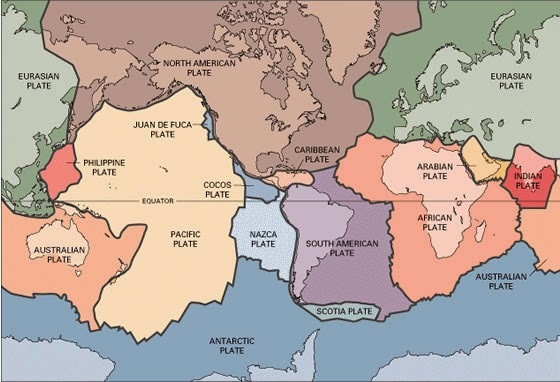 Most plates will have dry land masses on top of them that will form your continents or at least parts of your continents (i.e. these land forms are of high enough elevation that they aren't completely covered by water.) Some plates may be entirely underwater. The plate boundaries are where much of the magic happens. I recommend watching the youtube video below for a great overview. Some boundaries will be spreading centers, where liquid rock from the asthenosphere is brought up and the plates move apart. Two notable spreading centers in the ocean are the Mid-Atlantic Ridge and the East Pacific Rise but spreading centers can also exist on land. The East African Rift Valley represents a boundary where a large portion of lithosphere is breaking off of the African continent. At spreading boundaries the crust is thin and there is a lot of volcanic activity. On Earth, most of this happens underwater. Volcanoes can also happen in a middle of a plate because there is are hot spots under the crust in some places, but that is not as common as on plate boundaries. (But as a plate moves across a hot spot you will also get Volcanoes.) This can form island chains. Other boundaries will be where the plates collide (converging boundaries) and some plates can be forced underneath others. When this happens these are called "subduction zones" and are where the crust of one place is forced down under another and melts. This molten, less-dense rock, however, likes to rise toward the surface and can form volcanoes or help to build high mountain ranges (or both.) When one plate is forced under the other it also help push some of the material in the other up higher. The Andes Mountains are a direct result of this collision. Where some plates collide you may get deep trenches. The most extreme example is the Peruvian Trench along the western edge of South America. Here, the Nazca Plate is being forced beneath the South American Plate. Trenches, however, do not always form because the rock that the continents are made is generally lighter. There are other converging boundaries where there is no volcanic activity because both plates are continental plates and they weight the same. Here there is no subduction, just massive deformation along the edges of the plates. A good example is the Himalayan Mountains where the European and Indian plates meet. Here the plates have caused the crust to buckle, wrinkle and uplift into the highest mountain range on earth. There are also a few boundaries where plates are just sliding past each other (transverse boundaries.) In this case there is a lot of tension where the two plates are sliding and scraping past each other. The result is cracks in the crust called faults. As the plates move past each other some chunks of crust and overlying rock are broken into fault blocks. When there is a big enough movement along the cracks or faults in the earth's crust we feel it in the form of earthquakes.